Federal government announced it will join a whistleblower’s civil lawsuit against the company accused of using faulty concrete material in the panels of the $2.7 billion Metro Silver Line project in Virginia. The federal government will join the lawsuit against Universal Concrete Products of Pennsylvania by late July. In doing so, the government is making clear that it has substantiated at least some of the allegations of failures by the concrete company. It is possible the government has also learned of other failures by the concrete company. Per Transportation Reporter Adam Tuss’ exclusive report in April, the concrete issues raised serious concerns about the durability and quality control of a massive regional transportation project. The Silver Line extension is an 11.4-mile growth of the system to bring Metro trains to Reston Town Center and Dulles International Airport. Officials for Universal Concrete Products did not immediately return a request for comment. A whistleblower filed the civil lawsuit in 2016. It was unsealed Monday by a federal judge in Alexandria. The suit alleges the concrete company altered testing results, including about water-to-cement ratios in some of the materials. According to Tuss' report, the largest worry about the project’s concrete involves panels that serve as walls for the new Metro stations. In some cases, the water-to-cement ratio is off, the steel inside the panels is not covered by enough concrete and there are insufficient safeguards for water to expand and contract. 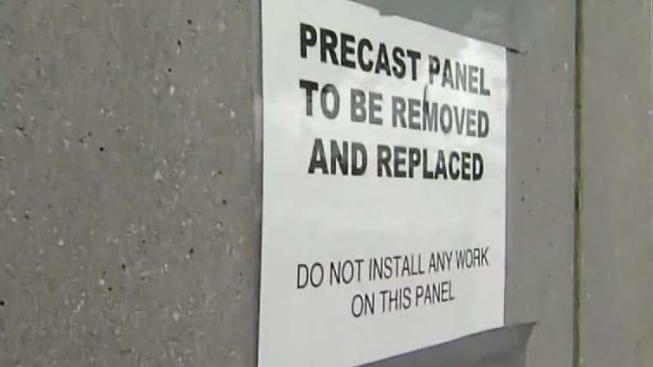 In all of these cases, water could penetrate the panels, leading to cracking and rusting.